A Memorial Service for Sylvia Gent took place on Saturday 14th April at St George’s. Sylvia was a member of St George’s congregation for many years, and moved to Chalfont St Peter, Buckinghamshire, in 2016 to be nearer her family. We had hoped the family would provide an Eulogy for publication in the magazine, but unfortunately it has not been received. 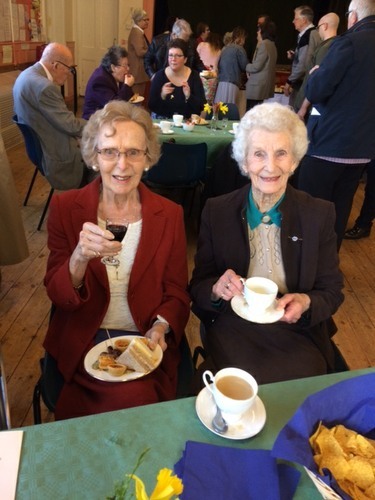 However, we do have the photograph below of June and Eileen, taken in the hall after the memorial service. Somehow June managed to wangle a glass of sherry, whilst Eileen is stuck with a cup of tea.